Our goal at My Reef Creations is to produce creative solutions and professional quality for all levels of reef enthusiasts. 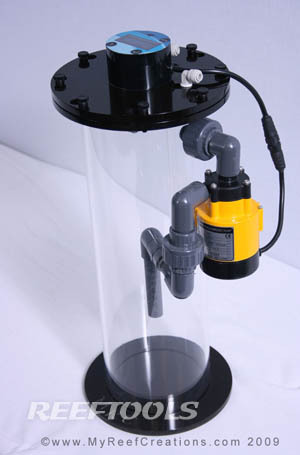 My Reef CreationsTM is proud to bring you quality Protein Skimmers, Waste Collection, Calcium Reactors, Sumps, Aquariums and DIY Parts at affordable prices. All equipment is hand made only after receiving an order. By doing this, We can custom make equipment to fit your needs. No more trying to fit a skimmer in a tight space. We specialize in custom sizing. We are also happy to answer any questions regarding your equipment before and after your purchase. My Reef CreationsTM commitment is to bring innovative ideas combined with quality workmanship at affordable prices. Don’t settle for less than a MRC product. Make sure you know what you are buying from other vendors. All reactors and protein skimmers are not built with the same exacting materials and attention to detail. We use state of the art equipment to bring you the best possible product at the best possible price. Check out the Features of MRC products. MRC offers an entire line of products to make your reef project a success -including Protein Skimmers, Calcium Reactors, Custom Reef Sumps and much more. We build our business around your needs and requests, so custom orders are always welcome and cost-effective for your specific and unique system requirements. And if you ever have any questions about MRC products, we’ll be delighted to help you find answers (we customize those too). You won’t find My Reef Creations quality anywhere else. Scores of prospering reefs are now growing in tanks around the world because of MRC’s superior performance, dependability, and durability. We manufacture all of our products using quality materials, including all cell cast acrylic, and a personal attention to detail. But don’t take our word for it, we’ve got plenty of backup (hyperlink to testimonials). The residents of your tank demand the best, and we feel that’s exactly what they deserve. Whether you require a modest package for a 20 gallon Nano tank or custom solutions for a commercial set-up, My Reef Creations has the equipment that’s right for you. Plus, we can customize our products to fit your space requirements – no more squeezing equipment into small spaces or fumbling with hoses and valves you can’t reach. We’re here to offer you unique and effective results for even the most unusual challenges. 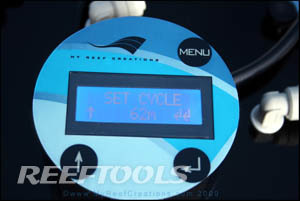 My Reef Creations provides quality, custom equipment at competitive prices. We work hard to design and manufacture our products as efficiently as possible so we can pass that savings and value on to you. The result is a satisfied MRC customer, happy fish and some beautiful reef creations. Besides offering the best supplies in the industry, we’re always working on new technologies here at MRC. So keep checking back with us for the latest developments and advancements in reef evolution. And if you have ideas for an improvement or invention that you’d like to share, we’d be happy to listen to your suggestions. If you should ever have a problem, question or just need a few pointers, My Reef Creations has a dedicated staff that hasn’t been stumped yet. Most e-mails are answered within 24 hours, or just call us to discuss your needs. We care about the success of your tank just as much as you do. Remember- we’re a bunch of hobbyists too. The new Nilsen (kalk) Reactors from My Reef Creations provide simple and complete control over kalkwasser dosing. Each of the Nilsen reactors come with a programmable touchpad interface which allows the hobbyist to set mixing timing intervals. The MRC interface can be set in intervals down to the second, giving the hobbyist the ability to customize mixing times to fit their system. Unlike many other Nilsen Reactors, the MRC reactors feature a heavy-duty external pump (Panworld/Blueline), providing more powerful and reliable performance. The unit requires only one power cord, connected to the LCD display. The pump connects to the control panel with a waterproof connector. There are currently three models available, small, standard and large. All three models have an 18″ tall chamber, and are 4 1/2″, 6″, and 8″ in diameter, respectively.